Cultural Appropriation was a term I first encountered one day last week while participating in a writers’ group page on Facebook. Although I was not familiar with the term, I’ve had first-hand experience in wrestling with it in my own writing. As I started looking for a definition of cultural appropriation, I found a wealth of online references, which proves that I just haven’t been paying attention. After you’ve finished reading my blog post today, I invite you to read The Guardian article referenced above. That article includes the following novelists’ views on cultural appropriation: Hari Kunzru, Kamila Shamsie, Aminatta Forna, Chris Cleave, AL Kennedy, Stella Duffy, Linda Grant, Naomi Alderman, Philip Hensher, Maggie Gee, and Nikesh Shukla. These are writers of various ethnic backgrounds, which makes their comments especially poignant. Another person in the writers’ group on Facebook shared that he had given up on publishing his historical novel based on the life of Etienne Annaotaha, a Canadian First Nations hero after seeing how much flack Joseph Boyden caught for his writing, even though Mr. Boyden is 26% Native American. Imagine how a 100% European ancestry writer would be treated for writing about Native Americans if someone like Mr. Boyden is not accepted? In the historical novel I’m writing, set in the Carolinas in the 1760s, I’m attempting to write from several points-of-view, including that of a male slave and that of a free woman of color. My challenge is to be true to history while writing about fictional characters. I might not get it right. I found a truck-load of encouragement from the Morgan Jones quote highlighted above! I have typed it and taped it to the bottom of my computer screen so I can read it every time I sit down to work on my novel. So should there be boundaries on what a novelist can write about? Cultural appropriation smacks of censorship, and I’m not for censorship in fiction. I don’t want someone else deciding what I should or should not read. Likewise, I don’t want someone else deciding what I should or should not write. As a Southerner, I have not appreciated the disingenuous portrayal of Southerners in movies and television programs all my life; however, I uphold the creators’ right to produce that work under the First Amendment of the Constitution of the United States. Censorship is a slippery slope I don’t want to see us go down. All that said, I will be mindful of my use of dialect in my novel. There are better ways to get across time, place, and social standing than hitting the reader over the head with dialect. I’ve taken some courage from researching cultural appropriation. Although I was ignorant of the term itself, I’ve given a lot of thought to the subject for the years I’ve been working on my own novel. I was also inspired by a dream I had last Monday night. As far as I can remember, it was the first time I dreamed that I was writing. I was writing my novel, and the words were flowing faster than I could write them down. The odd part was that I was writing in cursive, although in real life I do all my writing on the computer. I hope you have a good book to read. I’m trying to finish reading A Gentleman in Moscow and I’ve started reading The President is Missing, by Bill Clinton and James Patterson. If you’re a writer, I hope you have quality writing time. I plan to get back to work on my historical novel (working title, The Spanish Coin) with a renewed since of dedication since recharging my batteries in the Blue Ridge Mountains a couple of weeks ago and since reading about cultural appropriation last week. I invite your comments below. What are your feelings about cultural appropriation? Have you read any good books lately? What have you been up to? What’s on your mind? This is the 19th day of the A to Z Blog Challenge, so I decided to write about Social Media. (19 letters down, seven to go!) Those of you who have been following my blog for several months know that being social on media is not my favorite pastime. I don’t want to beat a dead horse, but writers are pushed from all sides to embrace social media. I can’t seem to escape it. I read an excellent blog post about writers and social media on April 19, 2017, “The Personalities of Social Media” at http://writersinthestormblog.com/2017/04/social-media-101-lets-talk-personalities/. Jenny Hanson wrote “The Personalities of Social Media” blog post. I don’t want to steal her thunder, so I invite you to read her post if you wish. Reading that Writers in the Storm blog post clarified for me why certain social media outlets appeal to me more than others, and it gave me permission to stop worrying about LinkedIn. Whew! It was worth the read just to learn that. What I learned from Ms. Hanson’s post is that social media fall into two camps: (1) ones that require immediate response and (2) ones that you don’t have to respond to immediately. I’m not by nature a phone person. People whose cell phones are a permanent extension of their hands do not understand me any more than I understand them. Let’s just agree to accept each other and not be judgmental. I enjoy some aspects of Facebook, but it is something that I usually check once every day or two. Apparently, I’m not using it correctly. I’m sorry, but I really don’t care to see a picture of what you ate for lunch. (I’m trying not to judge.) I like it because it provides a way for me to know when my friends have a joy or concern they want to share. It provides a way for me and friends with whom I share political views to commiserate. I get on Twitter once- or twice-a-day, which means I’m not using it correctly either. I have made some interesting connections with other writers and several published authors via Twitter, but I might not be putting enough original information in my Tweets to keep those relationships going. Twitter gives me a way to publicize my blog, and I have gained many blog followers as a result. I haven’t been active on Google+. I haven’t seen it as a good fit for me; however, after reading Ms. Hanson’s post, I have a better understanding of how it is a powerful way to increase my search ranking on Google. I guess I need to give Google+ a fair chance. I have an Instagram account, but I really haven’t gotten excited about it. Ms. Hanson’s blog post includes links to two articles about Instagram that I definitely need to read. I’m sure my hesitancy to use Instagram stems from my strained relationship with my cell phone. It probably goes without saying that I haven’t even investigated Snapchat. Apparently, I need to if I want to attract a younger demographic to my writing. It’s visual, and it’s only there for 24 hours. I really enjoy Pinterest. It is a good way for me to find articles about the art and craft of writing. I have set up several boards on my Pinterest account where I Pin the articles I like and think other writers who follow me might benefit from reading. I have a variety of boards on Pinterest, ranging from writing to recipes to quilting to politics. It’s a way for me to show my personality and varied interests. Pinterest can take up as much of your time as you will give it. One thing leads to another until sometimes I don’t remember where I started. My searches on Pinterest never disappoint me. Thank you, Jenny Hanson, for presenting information about the various social media platforms in a way that helped me to recognize why some platforms appeal to me more than others. And thank you for helping me to understand why Google+ is an important platform for writers. If you’re a writer, I hope you have rewarding writing time. Although I have made some good friends via social media and it does provide a way to stay in touch with old friends or relatives who live far away, social media stresses me out. If you’ve followed my blog for very long, you already know that. I just want to sit at my computer and write, but the publishing world tells me that I have to have a brand and I must keep my brand in front of my potential readers. I’m being told this is important before I even try to get my first novel published. It’s exhausting! In an effort to simplify social media for myself, I have looked into a number of websites that offer to do just that. There is an old adage that says, “You get what you pay for.” If I were independently wealthy, I could purchase all kinds of services that promise to put my social media life on Easy Street. That is not the case, though. If I had a multi-million dollar business, these services might make sense. They would be business expenses. I don’t make enough money from my writing yet to need big tax write-offs. Below, I’ve listed what I found out about five social media services that I can’t afford to try. Just because I can’t afford them doesn’t mean you shouldn’t use them. I’m not endorsing any of them, but I’m not trying to denigrate any of them either. Each Tweeter and blogger must decide for himself because each person’s situation is unique. The Ultimate Guide to Generating Leads on Twitter, a downloadable document by Steve Arnold, (steve.arnold@markethub.io) recommends Tweepi to, among other things, keep up with which of your followers are actually looking at your content. This allows you to drop followers that are just boosting your followers count. They aren’t interacting or helping you and you aren’t helping them. Unfortunately, the cheaper of the two plans Tweepi offers is $10.75 per month when paid annually or $12.99 per month when paid monthly. I can’t afford that, even though I recognize it would be somewhat beneficial to subscribe to a service like Tweepi. My conclusion: My world does not revolve around Twitter. I’m sure some of my “followers” are no longer “following” me. If they aren’t interested in books, writing, or an occasional political Tweet from me, that’s okay. I understand that literary agents and book publishers may want to have a clear idea of how many interested followers I have on Twitter, but it’s just not important enough to me right now to pay to get that information. It’s something to reconsider when I’m closer to getting a novel published. Mr. Arnold, of course, recommends that bloggers use MarketHub, since he is the company’s founder. His downloadable referenced above under Tweepi, states, “MarketHub pumps out extremely high value curated tweets on your behalf.” MarketHub offers a 14-day free trial. I hesitate to sign up for free trials because sometimes they’re difficult to cancel before a subscription fee kicks in. I have no idea if that’s the case with MarketHub, and I haven’t been able to find out how much MarketHub charges after the free trial period. My conclusion: I don’t really want a computer somewhere writing Tweets for me. I’d rather do my own writing. Period. With a free account, Commun.it will send out automatic weekly “Thanks for following me” Tweets; however, those Tweets include a flashy advertisement for Commun.it. I learned that the hard way. That was embarrassing! This has continued even though I went to the website and deactivated this feature which I admit I should have been aware of when I signed up. I’m still trying to determine how to best manage social media. I can’t afford a Business Account on Commun.it. My conclusion: I don’t know how to get rid of Commun.it. Maybe if I ignore their e-mails long enough, they will stop sending out “Thank you for following me and, by the way, don’t you also want Commun.it to send out Tweets on your behalf without your knowing it?” e-mails. Chris Andrews, a writer in Australia who reads my blog and I read his, advised me a few days ago to look into using Clicky.com. It’s a free service that should help me with this. I signed up for it, but there’s a glitch somewhere in a code so it’s not up and running for me yet. Stay tuned. Thanks again, Chris. I keep reading online that if I’m going to have a successful blog, I must use the trending keywords in my posts and in the posts’ titles. Otherwise, my SEO (Search Engine Optimization) won’t be good. In other words, no one will find my blog. Moz.com has a service called Keyword Explorer that helps a blogger find keywords that would be most advantageous for him or her to use in order to drive more traffic to their blog. I don’t mean to bad mouth moz.com, but their cheapest plan would cost me $948-a-year, if I chose to pay annually. If I chose to pay monthly, my annual cost would be $1,188. Ouch! That’s more money than I’ll make this year from my writing. A lot more. I looked into using Google Keyword Planner, another service that would find the best keywords for me to use in my blog post titles. Surely, it would be cheaper than Keyword Explorer. If I understood the adwords.google.com website correctly, they will “help” me for free as long as I spend at least $10-a-day on ads. No thanks! I don’t have a published novel to advertise yet. My conclusion: As of November 21, 2016 – just four months ago today – my blog had 220 followers and had been visited by people from 32 countries. As of 11:30 last night, I had. . . drumroll, please. . . 1,000 followers and my blog has been visited by individuals from 42 countries. I must be doing something right, and I’m not spending an arm and a leg to generate traffic. 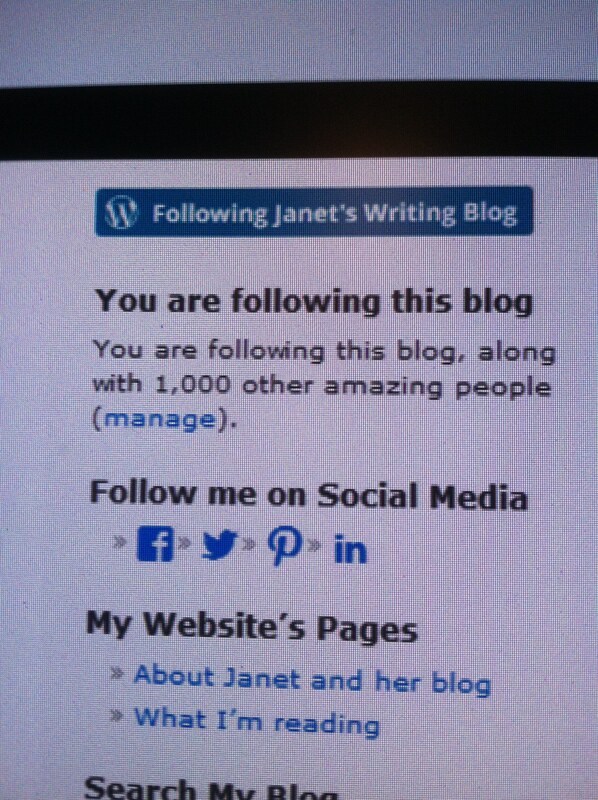 Proof of my 1,000th blog follower on March 20, 2017! Social media should be fun. It should bring people together – even people who don’t agree with each other on the topic being discussed. I will continue to blog and use Twitter, Facebook, and Pinterest. I might continue to use Google+. Two weeks ago, I created an account with Instagram. I might even use it someday. Rest assured that I do my own writing. That’s what writers do. They write. It upsets me when someone takes my words and claims them as their own. It upsets me when someone writes words and claim that they are mine. For the time being, except for those pesky Tweets commun.it keeps sending out, I plan to write my own Tweets, figure out my own keywords for my blog post titles, and refuse to stress out over who is following me on Twitter. Life is too short! I take Harper Lee, author of To Kill a Mockingbird, as my example. She didn’t play by any of the rules dictated by the publishing industry in her lifetime. I’ll play by the rules as necessary, but I’m not going to let social media control my life. This blog post makes me sound angry. I’m not angry. Just venting some frustration. Not ready to draw a line in the sand. P.S. Relax. My next blog post will be a sample of my writing. With any luck, it won’t be controversial and won’t contain any rants or venting.